Transparency Market Research (TMR) notes that the global endoscopy devices market is categorized by the presence of several large and small players operating in it. The rivalry between the players is likely to increase as they aim at offering technologically advanced products through their widespread distribution channels. Among the multiple strategies adopted by the players in the global endoscopy devices market to stay ahead of competition, product innovation has paid off the most. The global endoscopy devices market is expected to grow steadily due to the existence of large players who are investing in innovative branding ideas. Some of the leading players in the global endoscopy devices market are Ethicon Endo-Surgery, Boston Scientific, Olympus, and Stryker. 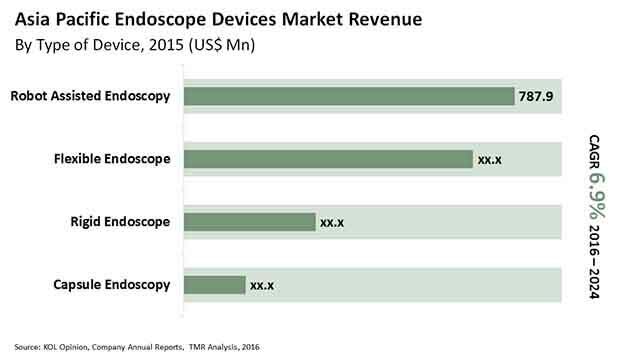 The TMR report projects the global endoscopy devices market to register a promising CAGR of 7.6% from 2016 to 2024. By the end of 2024, the market will be worth US$14.8bn, predicts the report. Out of the various types of endoscopy devices, the demand for endoscopy visualization systems is expected to remain high in the next few years as they provide high definition insight observation of the organs. Region wise, Asia Pacific is expected to lead the global endoscopy devices market in the coming years. This is attributed to flourishing healthcare industry in the region. Endoscopy devices help in detecting diseases and can reduce post-surgery complications. These devices are lighted medical devices which are extensively used in executing therapeutic interventions inside the visceral organs of the body. Rising incidence of cancer, rapid changes in demographics and lifestyles, and burgeoning population are factors driving the global endoscopy devices market. Endoscopy is mostly carried out to examine ulcers, digestive tract bleeding, abdominal pain, and abnormal growth of the colons. Growing aged population suffering from various diseases such as gastro-oesophageal reflux disorder, gastrointestinal problem, and ophthalmic diseases, and increasing demand for minimal post-surgery scars are boosting the global endoscopy devices market. Endoscopy devices are widely used in surgeries such as laparoscopy, arthroscopy, cystoscopy, mediastinoscopy, and bronchoscopy. The incorporation of endoscopy devices into such surgeries helps in directly observing the insight of the organs. These devices provide high definition two dimensional and three dimensional images. Furthermore, rising laparoscopic surgeries such as appendectomy, cholecystectomy, and hernia repairs, and rapid technological advancement in diagnosis, visualization, and surgical endoscopic treatment are fuelling the global endoscopy devices market. Along with this, increasing demand for endoscopic technologies for surgeries, rising awareness about advantages of endoscopy devices among medical professionals and patients, and growing demand for minimization of staying times in hospitals are propelling the global endoscopy devices market. Rising preference of other medical devices over the endoscopy devices, is one of the main challenges the global endoscopy devices market needs to overcome. Apart from this, highly expensive endoscopic treatments and costly endoscopy devices are also negatively impacting the market. Nevertheless, launch of less costly endoscopy devices will help underpin growth momentum in the next couple of years. The study presented here is based on a report by Transparency market research, titled “Endoscopy Devices Market - (Device - Endoscope Devices, Endoscopic Operative Devices, and Visualization Systems); Application - Urology/Gynecology Surgeries, ENT Surgeries, Neuro/Spinal Surgeries, Laparoscopy Surgeries) - Asia Pacific Industry Analysis, Size, Share, Growth, Trends, and Forecast 2016 – 2024”.